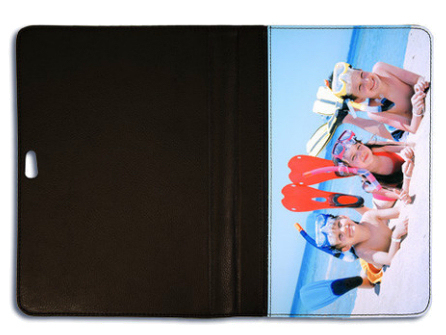 PictaLeather covered, impact resistant, hard back with gentle microfibre lined cover to protect the screen of the tablet with a front panel for dye sublimation printing. Do not place the entire cover under the press, only the printable panel should be exposed to heat. We recommend that you run a line of heat tape down the edge of the area alongside the printable cover so that you do not print directly onto the leather material of the cover. Prepress the printable panel to remove any moisture in the material, attach your transfer and then press for 50-60 seconds at around 190º centigrade using medium-high pressure.